A great tasting apple pie with a touch of cinnamon flavor and a crunchy topping. The crumbly topping adds just the right crunch to this delicious dessert. 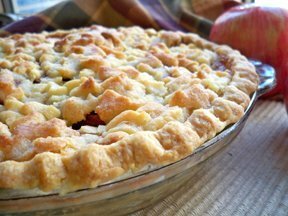 This apple pie recipe is a perfect way to enjoy the great taste of all those fall apples. After a pick of fresh apples, see how easy it is to make a quick apple crisp. You will have a fresh apple dessert in no time. Use our chart of apples to select the best variety of apple for all your cooking and baking needs.